Marquee training is back on campus! Join us to re-connect with current members and finance alumni at the Office Pub! This event is FREE for members & $5 for non-members (fee collected at door). Interested in learning more about careers in FinTech & Compliance? Join SFA for an evening of panel discussions moderated by Anferny Chen (IMBA’12) and a compliance workshop led by Raza Siddiqui. Panelist include C level executives from rising FinTech firms and experienced professionals in compliance and governance with financial services and crypto. This is a great opportunity to learn about the trends shaping the future of FinTech as well as network with industry experts! Financial modelling is forecasting a business’ performance into the future. You’ll start easy by forecasting revenues and costs for the next 5 years. You’ll then forecast an entire income statement, cash flow statement, balance sheet, and supporting schedules (depreciation/capex, working capital, tax, debt, equity). This is the basis of building more advanced models, such as a DCF model, for valuation purposes. Do I have to know how to build a model to attend? Absolutely not! The instructors will walk you through the entire model step by step! How will I benefit from attending this workshop? Mention your participation on your CV! Financial institutions recognize Marquee so you’ll get a competitive advantage in your job hunt! The Day On Bay is SFA’s most prestigious flagship event of the year! - $50 for non-SFA members (including one-year SFA membership). Tickets will sell out fast, so get your ticket now! The ability to communicate information accurately, effectively and as intended is vital to your professional life and something that should never be overlooked. SFA will be proudly hosting two communication workshops through experienced trainers from RBC to help you hone the skill and by doing so advance your career! Approaching the end of your studies and not sure about what to do after school? RBC On-Campus is here to help! This is a terrific event that will talk about what kind of jobs may be available in the marketplace and to provide you with some ideas for your future. We will have industry professionals from their respective departments tell you their story and how they got there. This includes Personal & Commercial Banking, Capital Markets, National Office Network Transformation, and HR. Seating is limited so please RSVP on the attached eventbrite link. The event is free, food and drinks will also be served. Do you want to expand your career into Canadian banking? Come and learn about the largest bank in the country! Interested in finance, but not sure where to start? This very week, SFA will be hosting a Career Panel with wonderful speakers from the areas of Investment Banking, Portfolio Management, Investment Management, and Equity Research. Feeling interested? Just click the button below to lock your seat! The Schulich Finance Association will be at the Schulich Club Fair for incoming Masters students on September 18, 2018 at the basement of Schulich Keel campus. Members who sign up during launch week will have the opportunity to join the SFA at the rate of $25 for one year (Sep ‘18 – Apr ‘19) and a discounted $40 for two years (Sep ‘18 – Apr ‘20). We look forward to meeting interested applicants. The Schulich Finance Association will be at the Schulich Club Fair for incoming MBA students on September 4, 2018 at the Marketplace of Keel campus. Members who sign up during launch week will have the opportunity to join the SFA at the rate of $25 for the 2018-2019 year and a discounted $40 for the 2018-2020 year. We look forward to meeting interested applicants. The Marquee Group is the leading provider of financial modeling training and consulting services. Marquee financial modeling courses are an integral part of the Big Five banks' orientation and technical training programs for new investment banking hires. This will be a unique opportunity for you to take your first step in learning about Excel financial modeling – an increasingly popular must-have in today’s hiring requirements – and add an eye-catching boost to your resume that can set you apart from other candidates. Space is limited so reserve your spot now with this Sign-up Form. *Who: SFA members will have first priority to sign up until January 22nd, 2017; then it will be open to the broader Schulich community. It's a first come first serve event. *How Much: $125 plus tax and 15% discount! (versus $500 typical market price). Payment will be collected directly by Marquee closer to the event. *Why: Financial modeling is a crucial skill in many professions within the capital markets arena, including investment banking, equity research, and credit analysis, among others. This training will provide a solid foundation upon which you could further practice and polish your modeling skills. 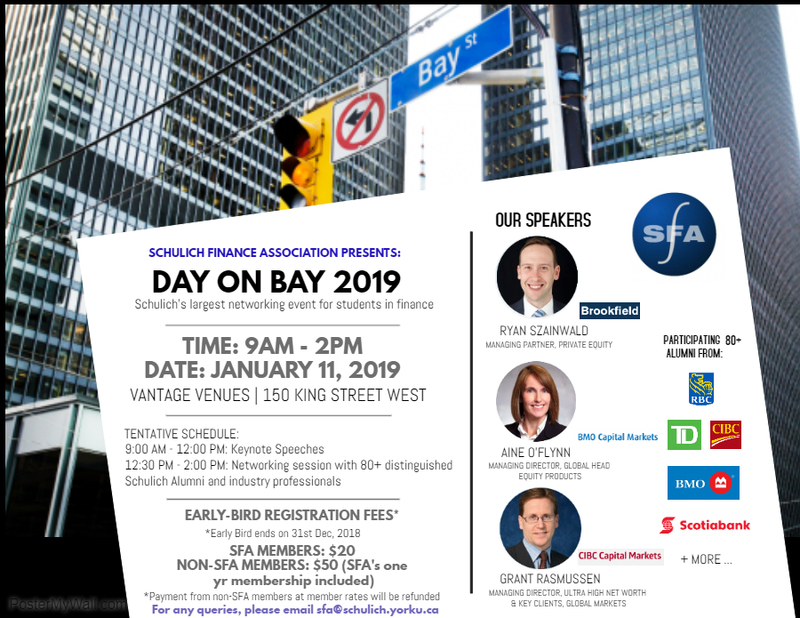 Co-hosted by the Schulich Finance Association and Schulich Career Development Center, the Day on the Bay is the largest finance event of the year. Dress code is business formal. The Marquee Group will be holding a finance interview preparation workshop to help students answer the most common technical finance interview questions they will face when applying for corporate finance roles. This is a full day seminar and is highly recommended for anyone applying for internships or full-time roles. The Marquee Group is an established and leading provider of finance training in Canada. These sessions are some of the most practical you will attend and one of the best perks of being an SFA member. Entry is $125 for SFA members paid directly to the Marquee Group. Once you sign up you will be sent a link to their payment portal. This is a huge discount as their regular price is $500 per person per session. Schulich Finance Association invites all of its members to the kick-off meeting for the year! We are excited to meet all the new and existing students of our SFA members to network and catch up with each other. It will be great for all of you to know who our executive team are and we are excited to know how we can make the most of your experience at Schulich and the SFA. Come join us and see you soon! Come join Schulich finance students and alumni for drinks and networking. The Schulich Finance Association will be at the Schulich Club Fair for incoming MBA students on September 6, 2017 at the Marketplace. Members who sign up during launch week will have the opportunity to join the SFA at the rate of $25 for the 2017-2018 year and a discounted $40 for the 2017-2019 year. We are also recruiting a first year student join the SFA's executive team and we look forward to meeting interested applicants. Interested in a career in Fintech? 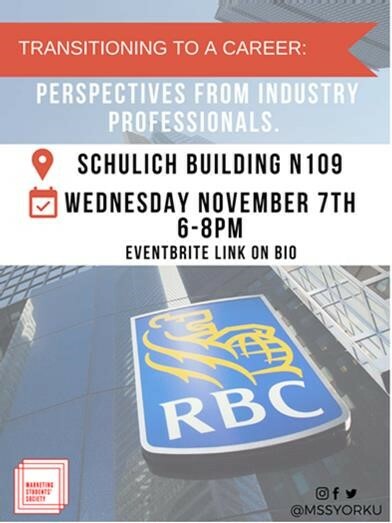 The Schulich Finance Alumni Association brings you a fintech career panel. This hands-on course is an intensive program that will transform participants into Excel “Power Users”. The course is focused on the pertinent Excel tools that are required in a business environment to efficiently analyze and manipulate data and to create compelling financial analyses. The course covers intermediate and advanced level Excel topics. As such, participants should have a good working knowledge of Excel prior to taking this course. Assignments, handouts and examples will be used throughout the day. Calling ALL MBA students. Do you have aspirations of starting your own business? Whether it’s full time or something on the side, one of the first things you will need to do is flush out how this business will work and more importantly, how you will make money. Thankfully, a workshop is being offered Friday March 17th at Schulich from 10am to 4pm on how to actually do this. This workshop is specifically designed for ANYONE who wants to learn how to build a working business model and perform any sort of projections. The workshop will focus on building an e commerce based subscription business in real time with the students. This workshop DOES NOT require an extensive knowledge of excel, finance, accounting or computer programming. We make it simple to understand and build and walk you through the entire process. It has been offered at Schulich for the last 4 years and each and every time, students feel like this is one of the most valuable investments of time they have made. The fee is $99 + HST. Space is limited to 25 students, so please register before it sells out. Come have a drink with Schulich finance MBA alumni and students. The Marquee Group is the leading provider of financial modeling training and consulting services. 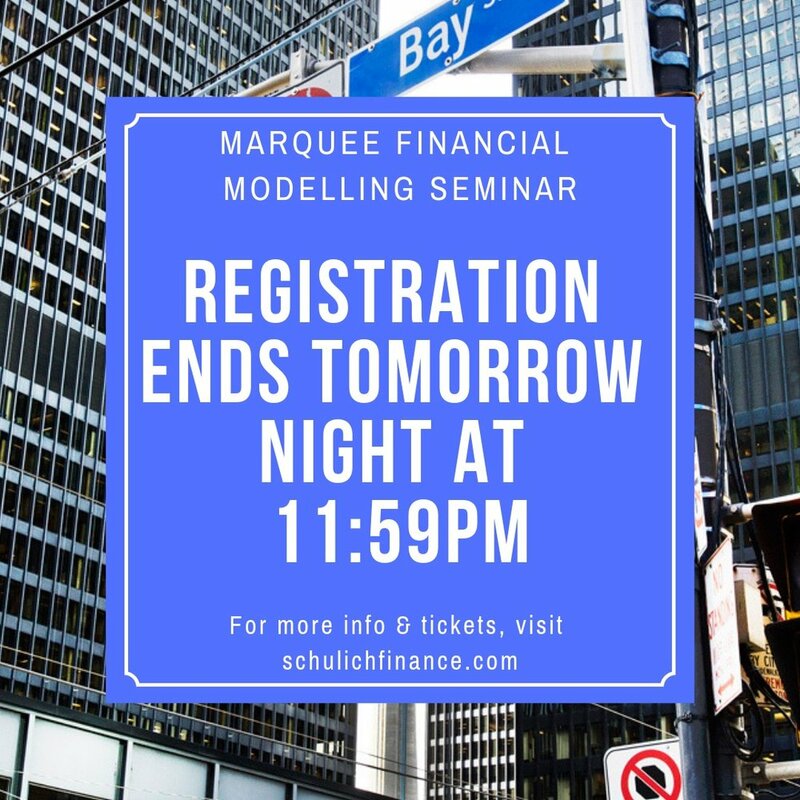 Marquee financial modeling courses are an integral part of the Big Five banks' orientation and technical training programs for new investment banking hires. This will be a unique opportunity for you to take your next step in learning about financial modeling and valuation of a company – an increasingly popular must-have in today’s hiring requirements – and add an eye-catching boost to your resume that can set you apart from other candidates. A risk manager's scope is very much dependent on the culture and product of the organization. The workshop will be led by Mari-Jo Hill, Director of Risk Management At SAS. She will provide an overview of what risk management looks like at a technology company that is dependent on employees' intellectual capital for its success. A panel of Schulich alumni will share their insights working in finance. Free event for SFA members only. Networking event for Schulich alumni and current graduate students.